Now through the end of the year, new members and gift memberships will receive their choice of one of three great books: our always-popular guides to the Walking Trails and Edible Wild Plants of the Vineyard, along with the temporary addition of Cooler Smarter: Practical Steps for Low-Carbon Living from the Union of Concerned Scientists. Membership in VCS also brings our print newsletter, Vineyard Conservation to your mailbox twice a year. If you’d like a preview, past issues are viewable at our website, or come by our office at the Wakeman Center to pick up a copy. "We have eco-friendly shrimp. We can make them; we have that technology. But we can never have an eco-friendly all-you-can-eat shrimp buffet. It doesn’t work." --Chef Barton Seaver, TED talk "Sustainable seafood? 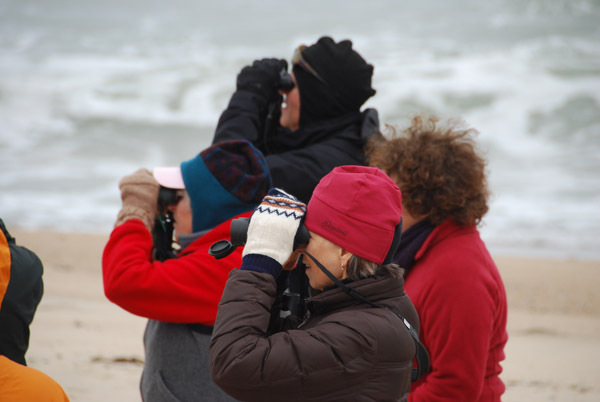 Let's get smart"
Wednesday, Jan. 1, 10:30 to 11:30 am, Edgartown. Felix Neck Wildlife Sanctuary kicks off the new year with a First Day Walk through the Sanctuary. $5, free for MA Audubon members. Re-use beats recycling any day. Free gently worn clothing at the Christ United Methodist Church (Stone Church). For more info, call 508-693-4424. It's not nearly as difficult to make your own homemade candied nuts as you might think! Separate an egg and beat the white until foamy (a few pulses in the blender will work). Mix together sugar, flour, and salt and gradually add this to the beaten egg white. Then stir in vanilla. Fold in pecans, mixing gently to coat. Spread on greased or oiled cookie sheet in one layer and bake for 45 minutes. Remove from pan immediately and store in a dry place. Thirty intrepid folks, comprising VCS members, friends, staff, and board got together on a chilly day in early December for one of our more arduous walks. Led by naturalist Soo Whiting and VCS staffer Jeremy Houser, walkers followed a circuitous path around Black Point Pond (a fairly large salt pond between Chilmark Pond and Tisbury Great Pond), traversing the farm fields and the roads, trails, and beaches of the Quansoo area, before returning to the historic Whiting farmhouse. 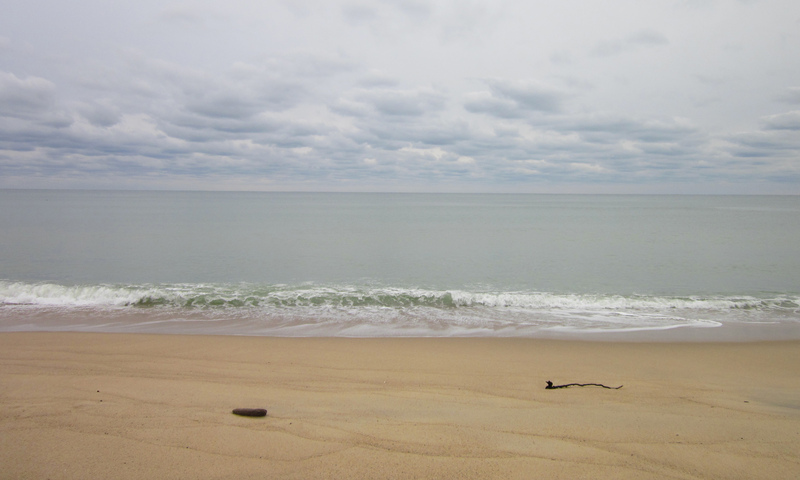 Thanks to all who attended, and we hope to see you next month at the Woods Preserve in West Tisbury! Quansoo Beach: The oceans may be eternal, but their shorelines, animal and plant life, even their chemistry, is changing today. A hearty thanks to VCS member Katherine Scott, who contributed a nice bit of history to the Gazette: a conversation with her father about his recollections of the area from the 1920s through the '40s. While the amazingly twisted and stunted oaks have stood by stoically, almost everything around them appears to be in flux, from migrating beaches and disappearing creeks to our human impacts. Change may be the only constant when living at sea level. 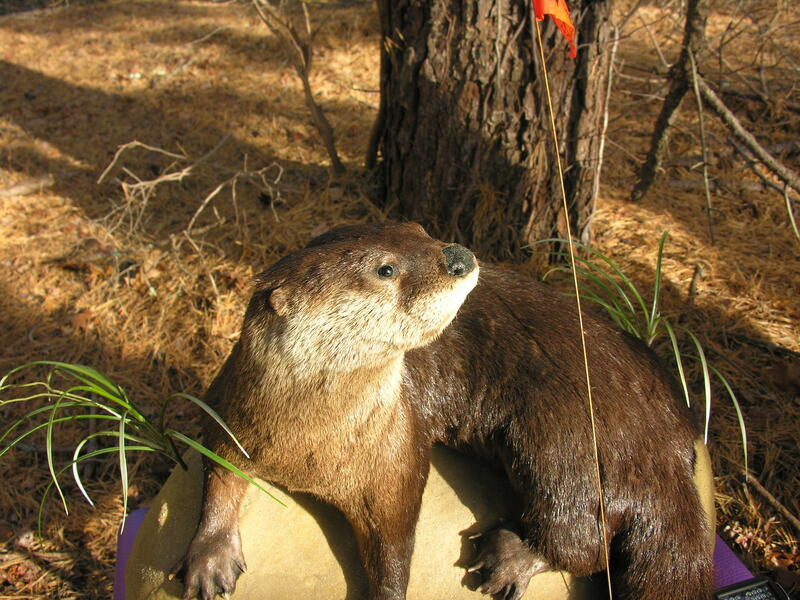 Make sure to catch local wildlife biologists Luanne Johnson and Liz Baldwin discussing their research on coastal river otters. Originally broadcast last week by WCAI on The Point with Mindy Todd, audio is archived at the station's website. 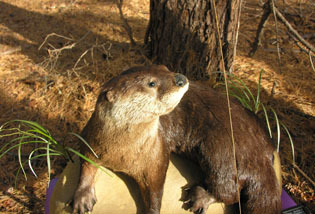 More on Luanne and Liz's otter research can be found at the website of their organization, BiodiversityWorks. The state office of Coastal Zone Management has recently launched a new website featuring a treasure trove of background and technical information on managing coastal properties in the face of ongoing erosion and storm damage. These six fact sheets (as CZM calls them) are substantial resources, providing an introduction to topics such as dune nourishment, beach stabilization, runoff control, and other topics that are essential reading for coastal landowners. In the coming year, CZM will add topics such as repair/reconstruction of revetments, seawalls, and groins; beach nourishment; elevating and relocating buildings; sand-filled envelopes; salt marsh creation and restoration on coastal beaches; and design standards for new revetments, seawalls, and groins. Has the McMansion Trend Finally Reversed? 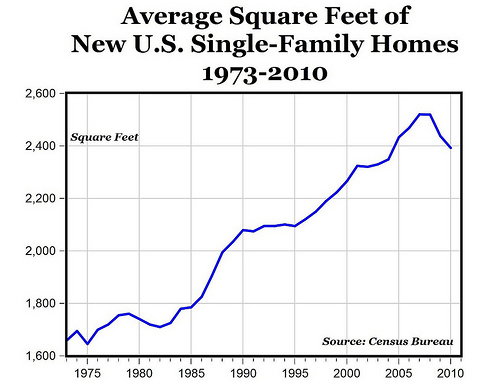 As shown above, data from the Census Bureau makes clear that the steady rise in the average size of new homes has finally stopped, and even dipped a bit in recent years. In a vacuum, that's good news no matter how it came about, but it's hard not to question whether it's mostly the result of the recession and sluggish recovery. Other survey data, though, suggest that the change could truly reveal something deeper: research by Trulia (an online real estate company) finds that American's "ideal" home size has also declined over the past decade, from a peak of 2,300 square feet to about 2,100 today. Read more at the Natural Resources Defense Council.